Spotlight on our November Contest Winner: Joann!! 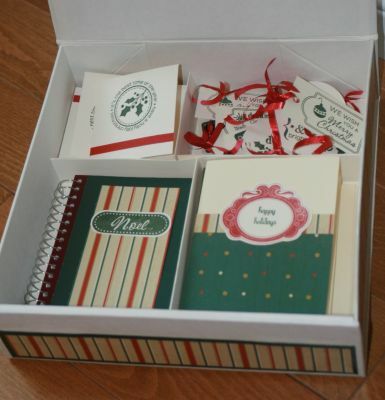 Joann’s box contained a gift of notecards for a family member. I bet she will be thrilled to receive THIS gift! Joann has been a member of the Club House since April, 2008. She can always be counted on for a cheerful word. Her creations are beautiful! 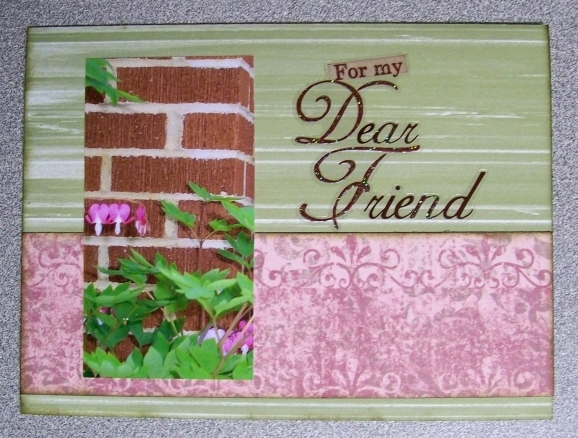 She has recently been chosen to receive “SBCH Kudos of the Day” for several of her cards and layouts. Congratulations Joann on a fabulous gift box creation and a well-deserved win: such excellent work! Looking forward to the all beautiful things you’ll be creating in 2009! December Celebrity Guest Designer Announcement! Andrea Wiebe, scrapper, teacher and designer extraordinaire will be joining us at the Club House for the month of December 2008! Here is a link to the announcement . We’re also thrilled to reveal that on December 1, Andrea will be participating in a Celebrity Question and Answer Chat on the forum! Check it out and be sure to join us for the “awesome” month of December! It’s going to be fab: We’ll see you there! 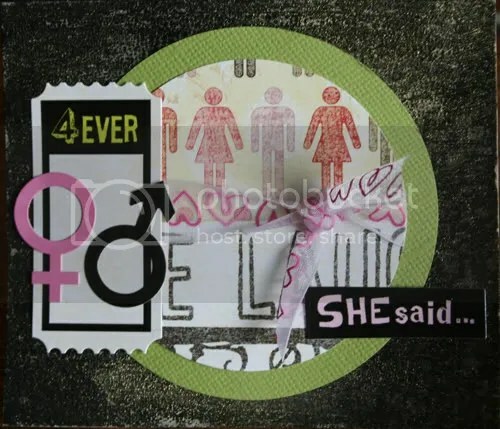 The popular Blog Sketch Contest is returning to Scrapbooker’s Club House. Come enter and gain added exposure for your creations! 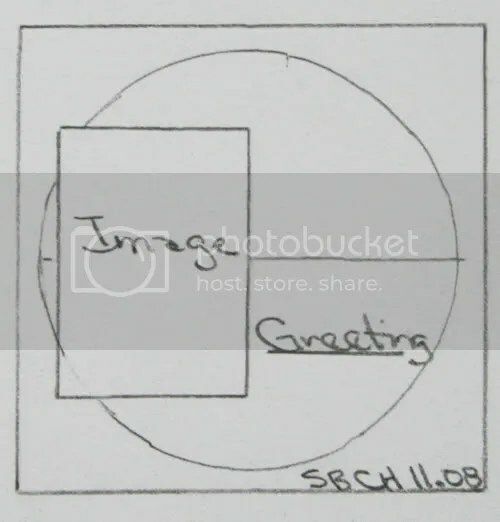 Create a card based on the sketch and upload it to the SBCH Gallery here, in the Blog Contest folder. The winner’s interpretation will be posted on the SBCH Blog next to the sketch. In addition, the winner will receive the honour of designing a sample LO for a SBCH blog contest scheduled for Jan 2009. Her design sample will be posted on the SBCH blog for all to admire! Let’s see those entries: Interpret the sketch and put your own spin on it! Go, go, go…! Deadline for entries is Nov 30th at midnight MST. Judging and announcement of winner will be Dec 1st. Please be sure to put your name and BLOG SKETCH #20 on your submission. Gallery requires that images be no larger than 1024 KB. This month Scrapbooker’s Club House is one BUSY place! We have three contests to tell you about in addition to some continuing inspiration and motivation! 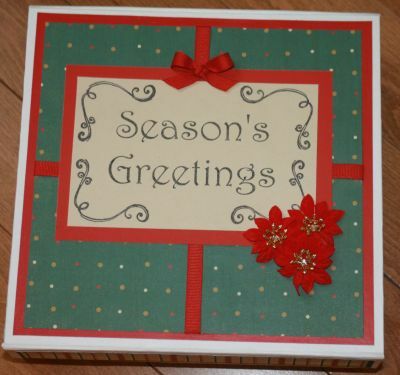 First, get ready to “Think Outside the Box!” The prize for this holiday themed box-making contest is four-fold, and involves a gift to a Children’s Hospital in your name. Winning will also earn you the title of SBCH Morning Cheerleader for a week! You can read about it here. Get those entries in: the deadline is November 22nd. A winner will be announced the 24th. Next, take your decorating abilities to the next level and create a home-decor item using your scrappy supplies! Check out the contest developed by our Design Team coordinator, Trina Carbert, here. You could be our winner and become the next SBCH Guest Design Team Member. You’ll receive an awesome SBCH Kit with which to design for the month of December! Don’t miss out on this fab opportunity to design for the Club House: the quality kits Nicole brings together are truly the best! We have a third exciting announcement this month… SBCH has brought back the Blog Sketch Contest! It all starts on November 20th. Don’t miss out on this excellent opportunity to have your work published online and noticed by MANY! Finally, I’d like to remind everyone that working at completing challenges in the November “Challenges by Design Collection” can also net you some VERY worthwhile results. Not only will you be completing layouts, you will also earn a chance to win a discount and/or a RAK from SBCH through the motivating Challenge Incentive Program held monthly by owner Nicole Drewniak. We hope you’ll participate in these contests and motivational activities to the “MAX” of your ability… we are so lucky to be scrappers here at the Club House! I dare you to go for it… Stretch yourself this month, and see just where it takes you! One of the best things about thinking green is that we are SO much more conscious of waste and are working to ensure that we get as much “mileage” out of things as we can before they hit the trash. 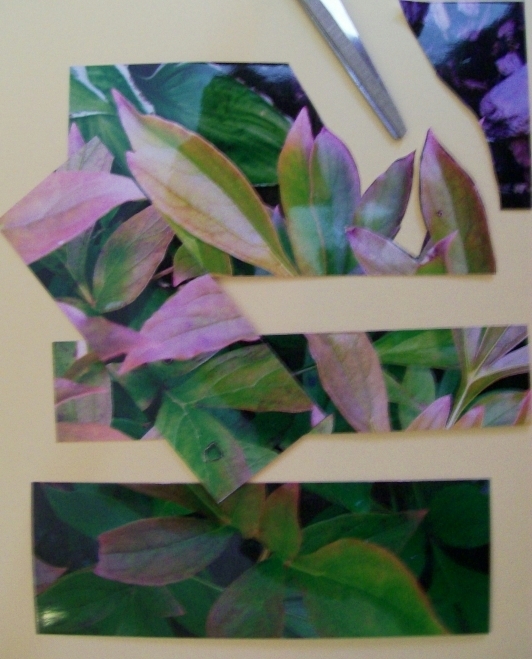 For me, this includes the pieces I trim (crop) from my pictures! I often save the cropped-off scraps as they provide interesting textures and colours that can be used as accents on layouts. Before I scoop them into the garbage bin, I have a quick look at what I have cropped from my photos. 1. 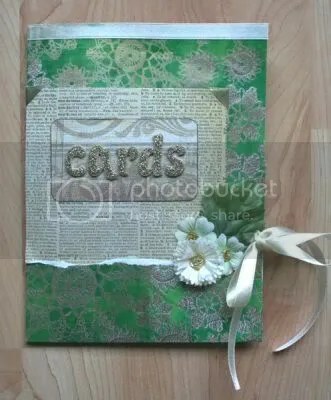 Is there anything on this cropped-off scrap that can be USED in another way for my SB’ing or cardmaking? 2. Can I utilize the colours this piece has on it? (ie: Scraps cropped from a bright, colourful pic.) Remember that back and white can be just as effective as an accent as “brights” can! 3. Is there any interesting texture? 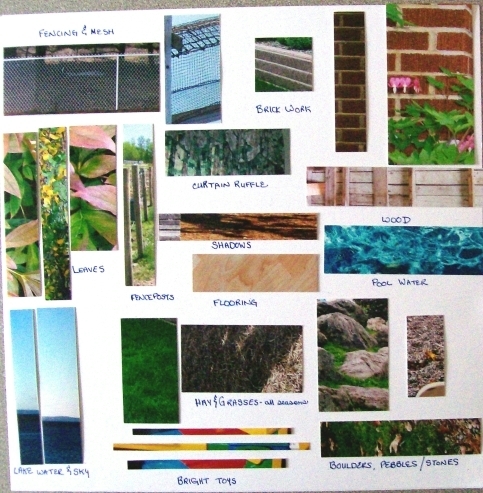 Look for: mesh fencing, sand, water, pebbles, rocks, waves, brick, wood, grass/hay, siding, roofing tiles/shingles, clouds, leaves, shadows, puddles, flooring, and fence-posts; the list is endless. Here is a photo showing some of the colours and textures from cropped-off scraps I have saved for future projects. 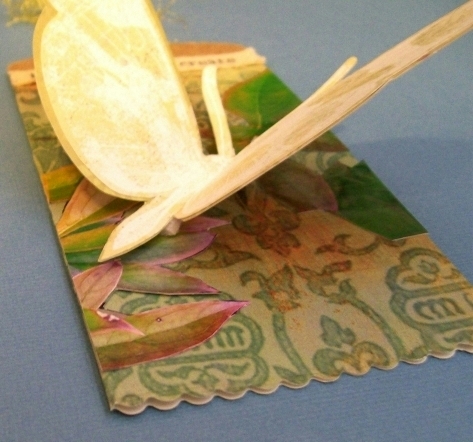 You can easily use such portions of cropped-off scraps to embellish cards and pages! Here are some examples of how this can be done. Look carefully…Rhododendron leaves that had been cropped from the edge of a garden photo were carefully trimmed for use on this tag. They add a touch of realism. Additionally, since the cropped off photo scrap was glossy (not matte, as I usually prefer) it added a bit of sheen under the moth which gave a nice effect to this muted tag. Here is a photo of the underside of the tag, where you can really see the leaves I added after they were trimmed from the cropped-off photo scrap. 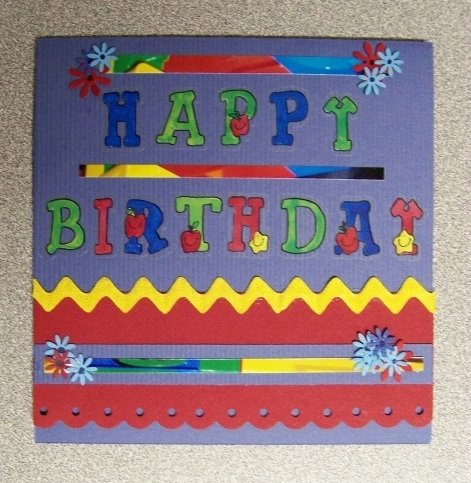 Colourful strips trimmed from a toy photo were used on this birthday-themed card! 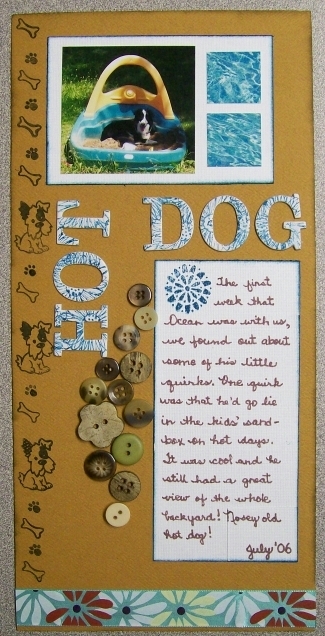 Cropped-off scraps from photos of the kids in the pool make perfect turquoise “Colour-Blocks” on a summer-fun pet LO. This cropped-off scrap boasted brick-work & a bit of “Bleeding Heart” floral interest- too beautiful to discard. This could be used either as a friendship card or as a sympathy card for a close friend. 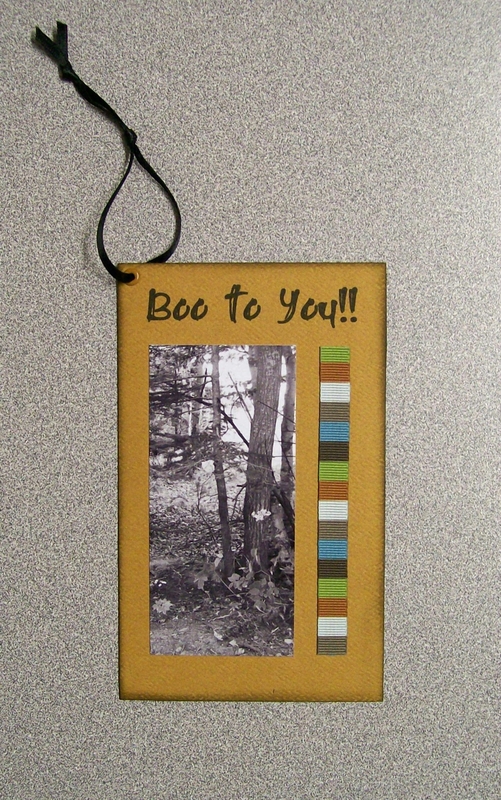 A cropped-off scrap of a black and white outdoor scene is perfect used on a tag made for a Halloween treat bag! Have fun seeing what possibilities lie in those “cropped-off scraps!” I’d love to see what you can come up with! Feel free to place a link to your creation in the “Comment” section below. Would you like to join our talented and friendly design team for a month??? We are now looking for our Guest Design Team Member for December. If you think you would like to try out this contest, read on! 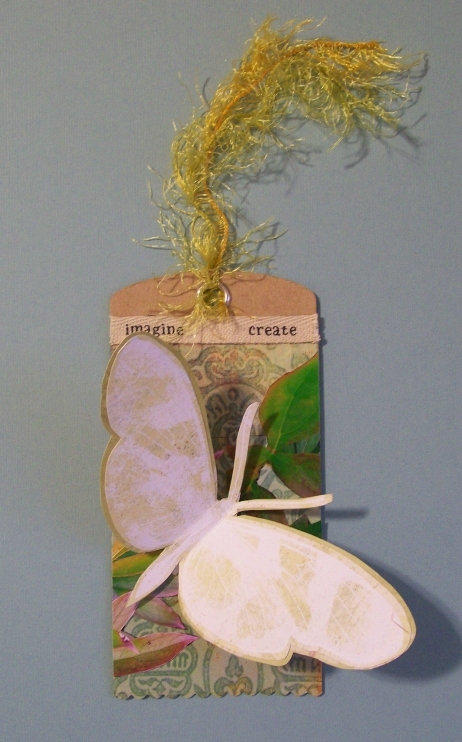 Your challenge for this contest is to create/alter something that can be used as Home Décor using your scrappy supplies. Examples: Framed pictures, altered candles, jars or other items, album covers, etc… You choose the theme and the home décor item you want to create/alter! You can keep it for your own home or give it away as a gift, as it is almost that time of year! Once you have created something for the challenge, please upload it to the “December Guest DT Contest” folder in the gallery. Remember to include your name in the title so we know whom to honor!!! The winner of the contest will design with SBCH Design Team Members for the month of December with a kit provided by the Club House. The winner will also post questions and kudos along with our Design Team! Deadline for entries: Midnight MST November 23rd. Term: December 1 – 31, 2008. If you have questions please PM me (Trina aka Scrappy) or email Nicole nicole@scrapbookersclubhouse.com or Ali peteali@eastlink.ca. We can’t wait to see your entries!!! !